Holding information within one’s memory for a short while is a seemingly simple and everyday task. We use our short-term memory when remembering a new telephone number if there is nothing to write at hand, or to find the beautiful dress inside the store that we were just admiring in the shopping window. 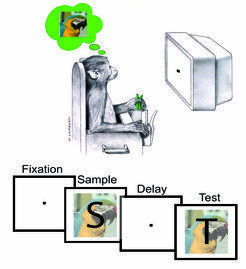 Yet, despite the apparent simplicity of these actions, short-term memory is a complex cognitive act that entails the participation of multiple brain regions. 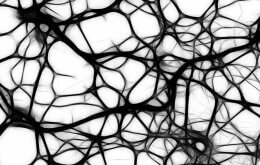 However, whether and how different brain regions cooperate during memory has remained elusive. A group of researchers from the Max Planck Institute for Biological Cybernetics in Tübingen, Germany have now come closer to answering this question. They discovered that oscillations between different brain regions are crucial in visually remembering things over a short period of time. It has long been known that brain regions in the frontal part of the brain are involved in short-term memory, while processing of visual information occurs primarily at the back of the brain. However, to successfully remember visual information over a short period of time, these distant regions need to coordinate and integrate information. To better understand how this occurs, scientists from the Max Planck Institute of Biological Cybernetics in the department of Nikos Logothetis recorded electrical activity both in a visual area and in the frontal part of the brain in monkeys. The scientists showed the animals identical or different images within short intervals while recording their brain activity. The animals then had to indicate whether the second image was the same as the first one. The scientists observed that, in each of the two brain regions, brain activity showed strong oscillations in a certain set of frequencies called the theta-band. Importantly, these oscillations did not occur independently of each other, but synchronized their activity temporarily: “It is as if you have two revolving doors in each of the two areas. 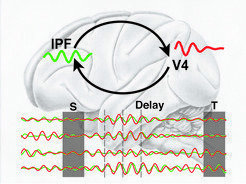 During working memory, they get in sync, thereby allowing information to pass through them much more efficiently than if they were out of sync,” explains Stefanie Liebe, the first author of the study, conducted in the team of Gregor Rainer in cooperation with Gregor Hörzer from the Technical University Graz. The more synchronized the activity was, the better could the animals remember the initial image. Thus, the authors were able to establish a direct relationship between what they observed in the brain and the performance of the animal. The study highlights how synchronized brain oscillations are important for the communication and interaction of different brain regions. Almost all multi-faceted cognitive acts, such as visual recognition, arise from a complex interplay of specialized and distributed neural networks. How relationships between such distributed sites are established and how they contribute to represent and communicate information about external and internal events in order to attain a coherent percept or memory is still poorly understood.